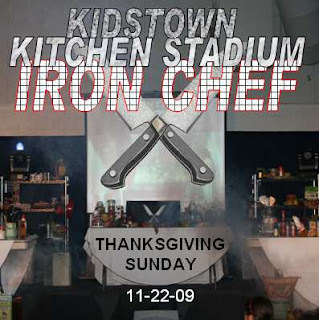 With a return of the cooking stage that has now hosted its fourth epic showdown, KidsTown Kitchen Stadium became the backdrop enviroment that housed this year's spectacular message theme for Thanksgiving that was all centered around, what else, food! This three week storyline kicked off the week of Thanksgiving with a battle for the ages that pitted our very own iron chef Michael Murphy and his Asian culinary point of view against newcomer Andrea Poston and her inspired Mexican fare. 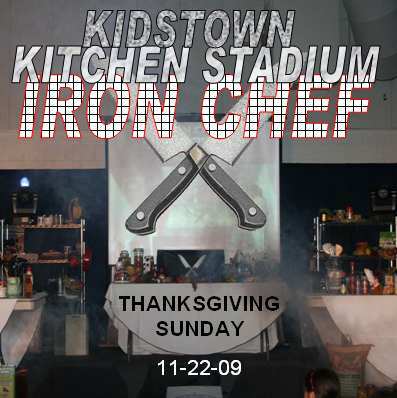 For KidsTown Kitchen Stadium, we had a humble beginning nearly three years ago with almost all the food on stage being fake food, just a few real ingredients, a couple tables, and some simple kitchen tools borrowed from the church kitchen. That first battle involved ice cream sundaes and tossed salads both being done by our two competiting chefs, Jared Dumale and Angela Porter. In the second battle, Jared returned and faced newcomer Skylar Leslie that included the secret ingredient of pumpkin and a special story about pumpkins for Halloween. 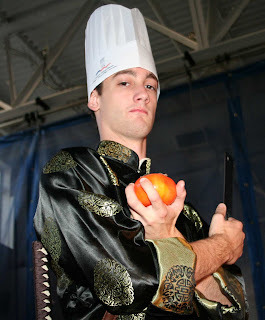 In Iron Chef III, Jared once again battled newcomers. This time facing off against Sam Leslie and his sous chef Morgan Eldred. This was the first time real edible food was actually attempted and served to judges. The secret ingredients were carrots and eggs. Coffee was also a key ingredient. The story that tied into the competition was on Elijah and the widow who didn't have enough oil and flour for bread. In this most recent battle, Iron Chef IV, the bar was again raised to see if it was possible to complete a fully scripted battle with all real ingredients and all real menus. After a food trip to the local Great Wall international food market for Michael's asian fare and several trips to the local Shoppers for Andrea's mexican menu as well as many new pots, plates, racks, and hot plates, the battle was ready to begin. With a packed house and enough power that eventually blew the building's power grid in three different places, Iron Chef IV was chopped, cooked, plated, served, eaten, and judged with the verdict coming back from the judges as a win for our newest competitor, Chef Andrea Poston. The conclusion of the battle eventually led into two more weeks of story telling by Pastor Josh in which he tells the tale of a man named George Washington Carver who created over three hundred uses from his secret ingredient, the peanut. And that Carver was able to do this using an internal "secret ingredient" that was a part of his life, his relationship with the Lord Jesus Christ- that it was Christ who would daily show him uses for the things that God had made. *Pictures of this show are available on Snapfish. For instructions on using Snapfish, click here. *To see the show, click here. You can also purchased a high resolution version in a display case by clicking here.